Hardex RS 650 Hi-Temp Red RTV Silicone Gasket Maker Hardex Hi-Temp Red Gasket Maker is designed to meet OEM specification for withstanding temperatures up to 650&deg;F. It forms any size or shape of gasket which is resistant to both high temperature and high pressure. Resists cracking, shrinking and migrating caused by thermal cycling. 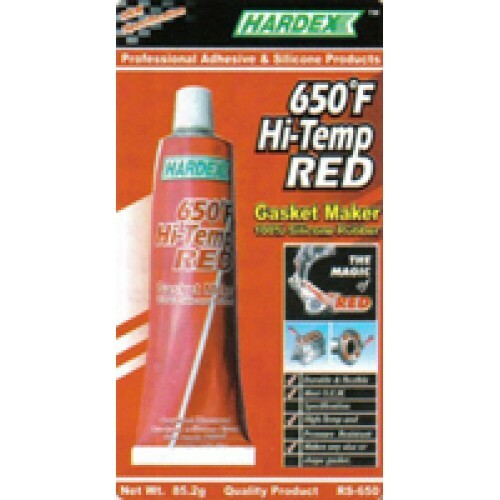 Withstands temperature from -80&deg;F up to 650&deg;F. Ideal application for timing covers, valve covers, oil pans, intake manifolds, exhaust manifolds and water pumps. Dries securely as gasket.